A few weeks ago Dell added a 2TB 2.5″ 7.2K RPM Near-Line SAS drive to the list of supported drives. This new addition not only increases the shared storage capacity of the Dell VRTX chassis from 48TB to 50TB but it also offers better performance. Previously the VRTX had a maximum shared storage capacity of 48TB which was achieved by using 12 x 4TB 3.5″ 7.2K RPM Near-Line SAS drives. 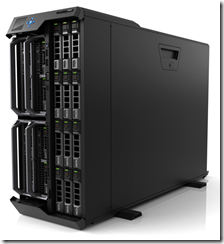 This required the use of the 12 bay 3.5″ drive model of the PowerEdge VRTX. Use of 3.5″ drives provides a lot of capacity ideal for archiving or file storage, but for performance it’s not ideal. Below is the list of current 3.5″ drive options. 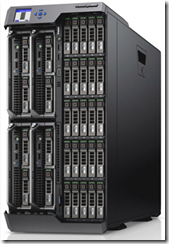 The Dell PowerEdge VRTX also comes in a 25 bay 2.5″ drive model. As you’ll see in the chart below, the 2.5″ drive model provides many more options, including the ability to hold the largest drive capacity. The newly announced 2.5″ 2TB drive used with the 25 drive bays will give you 50TB raw shared storage. In addition, the 2.5″ chassis model provides many more spindles compared to the 3.5″ drive model so you can expect much better application performance. Also, the 2.5″ drive model is where you’ll find SSD options for those performance hungry applications. You can have a mix of drive types (SAS, NL-SAS, SSD) in the shared bays within VRTX but you can’t mix and match when creating virtual disks. If you view the VRTX storage as Direct Attached Storage (DAS) you’ll recognize that you won’t find advance storage features like snapshots, replication, compression, deduplication, etc.